We own and offer for rent a selection of properties including houses and rooms to let in shared house designed to suit professional people. We will add any available rentals to this page and also on our FACEBOOK page which you can access if you click the logo directly above. We pride ourselves on providing properties that we would be very happy to live in rather than just your typical 'rental' properties and as TRACY always says about our tenants; "it might be our house but it's their HOME!" We like to think that we go 'above and beyond' what any other landlord offer. Please click HERE to visit our page where we always add the latest news about our properties. Don't worry, you don't have to be a member of FACEBOOK to view our page! 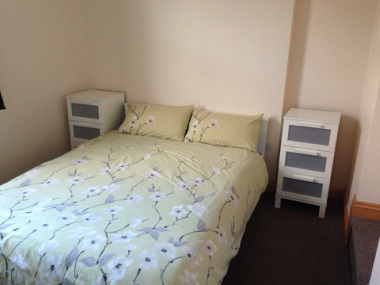 High quality, well maintained shared house offering single-occupancy rooms with their own own ensuite. We bought these two properties several years ago and spent considerable money refitting them for this purpose and to our own high standards. The houses are in Albion Street, Exmouth, EX8 1JN. Each room has its own private integral ensuite, and the furniture includes a double bed, bed side cabinet, wardrobe and fridge. Every room in the house is centrally heated, carpeted and each room has a fitted blind and draw curtains to give it that 'homely feeling'! Each room is lockable. There is a shared kitchen which has two ovens, two hobs and two sinks and each tenant has their own lockable base and wall unit. There is also a shared courtyard garden and a storage covered area for bicycles and communal lounge. The communal areas are cleaned by us every two weeks. The property benefits from wi-fi access. The property is 50 metres from Exmouth Town centre and is in easy walking distance of the bus and train station. There is no dedicated parking although you are able to park on the road and there is also a paying car park directly opposite. Sorry but these rooms are for professional people, single occupancy and we are unable to accept pets or any form of benefits. This property is suited for professionals and if you're looking for a 'party house', we're afraid this property is not for you. The rooms are on offer at £400 per calender month and this includes all bills. A deposit of £400 is also required. In order to secure a room, we ask for a £100 deposit (non-refundable) although providing all the necessary checks come back satisfactory, £50 of this amount then will get deducted from the first months rent (the other £50 is to cover credit referencing expenses). The tenancy is for 6 months (short-hold assured) although a 'rolling tenancy' may be offered after this period. Please give Tracy a call who will be more than happy to provide you with any further details or to arrange a viewing.